MANILA, Philippines --- US President Donald Trump and Philippine President Rodrigo Duterte led heads of state from across Southeast Asia and beyond in singing the Adventist favorite chorus "Side by Side" at the ASEAN summit in Manila today. 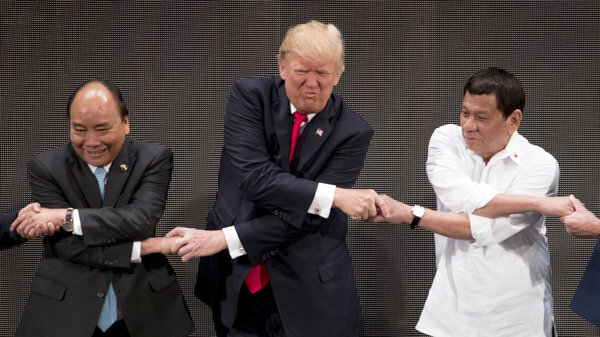 Although it took some time for Trump to get the hang of the Southeast Asian crossed-arm style of linking hands, he soon took to the local custom with enthusiasm. As the politicos linked hands, Trump suggested they mark the historic occasion by singing "a fun little chorus my friend Ben Carson taught me." With the help of Duterte (world-renowned for his singing abilities), Trump led out in the chorus as members of the press snapped pictures and set social media platforms on fire with video clips of the politicians singing. Afterwards at lunch, a vegetarian version of Filipino delicacy lechon (an entire roasted pig) was served in honor of the origins of the chorus that had just been performed. Which side are they on anyway? They should be singing Kum By Yah or Michael Row your boat. Where is Pete Seeger?